W Bearing our customers’ requirements and market demand in mind, in 2018 we proudly present a number of new exciting products to the market. 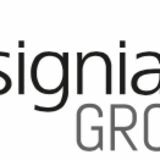 You will ﬁnd they are smartly designed and well made, as we are committed to promoting your professional corporate image and providing stylish personal protection in all environments. Kensington Jacket & Gilets with & without hood are super soft touch with padding and ﬂeece lining. Female cut in hot pink colour is available for the ladies at work. Fontaine Storm and Flight Jackets are made with rip-stop breathable and waterproof fabric. The removable Sherpa ﬂeece lining makes them ideal for all year wearing. You can explore some great functional features built in both Fontaine Jackets. Executive Waistcoat available in 26 colours & open mesh fabric for hot environment. Super Light & Top Cool V-Neck T-Shirts made with perforated reﬂective tape for best breathable quality. Dog’s vests are superb to keep dogs dry and seen. We’d love to hear your feedback about YOKO products! Long-awaited ladies waistcoats and jackets with unique design. HVW706 Kensington Jacket (with ﬂeece lining) Sizes: XS - 3XL Carton Qty: 15 Fabric: Quilted polyester shell/ padding/ﬂeece Weight: 340 gsm Features: A smart-looking Hi Vis Jacket blended with safety, comfort, quality and style. Soft touch, nicely quilted and shower proof. Hi Vis Yellow & Orange compliant to EN ISO 20471: 2013 Class 3; Orange also compliant to GO/RT3279 for railway industry. Two 5cm width “V” shape reﬂective tapes on the body and around arms for best visibility in the dark. Straight up collar with chin protector, both the chest pocket & two hand-warmer inset pockets come with zip closure. One large patch pocket on the inside ﬁxed ﬂeece lining. Additional reﬂective piping around the ends of each sleeve and body offers extra visibility and cool look in the dark. Great colour choices for both work and leisure wearing. Inner bottom concealed zip decoration access. YOKO Hi Vis Kensington Jacket will keeps you warm & visible, on those brisk days thanks to its windproof & showerproof but lightweight material. It makes you look smart at and after work. Comfortable and quiet, useful and practical. Black, Navy & Hot Pink provide enhanced visibility. HV007 Kensington Hooded Gilet Sizes: S-3XL Carton Qty: 15 Fabric: Quilted polyester shell/ padding/ﬂeece Weight: 340gsm Features: A smart-looking Hi Vis Gilet blended with safety, comfort, quality and style. Soft touch, nicely quilted and shower proof. 2013 Class 2. Orange also compliant to GO/RT3279 for railway industry. Two 5cm width “V” shape reﬂective tapes on the body. Fleece lined hood with elastication, both the chest pocket & two handwarmer inset pockets come with zip closure. One large patch pocket on the inside ﬁxed ﬂeece lining. Additional reﬂective piping around the elasticated arm holes and on the bottom of the body offering extra visibility and cool look in the dark. Great colour choices for both work and leisure wearing. Inner bottom concealed zip decoration access. A smart-looking Hi Vis Gilet blended with safety, comfort, quality and style. Ideal for wearing at work and leisure purpose. Navy provides enhanced visibility Only. HV009 Kensington Gilet With Fleece Lining Sizes: S-3XL Carton Qty: 15 Fabric: Quilted polyester shell/ padding/ﬂeece Weight: 340gsm Features: A smart-looking Hi Vis Gilet blended with safety, comfort, quality and style. Soft touch, nicely quilted and shower proof. Hi Vis Yellow & Orange compliant to EN ISO 20471: 2013 Class 2. Orange also compliant to GO/ RT3279 for railway industry. Two 5cm width “V”shape reﬂective tapes on the body.Stand up ﬂeece lined collar. Both the chest pocket & two handwarmer inset pockets come with zip closure. One large patch pocket on the inside ﬁxed ﬂeece lining. Additional reﬂective piping around the elasticated arm holes and on the bottom of the body offering extra visibility and cool look in the dark. Great colour choices for both work and leisure wearing.Inner bottom concealed zip decoration access. N s H009 Ko l W   ae I   A smart-looking Hi Vis Gilet blended with safety, comfort, quality and style. Soft touch, nicely quilted and shower proof. HVP309 Fontaine Storm Jacket Sizes: S-3XL Carton Qty: 10 Fabric: Fontaine Rip-Stop Check Pattern Polyester Weight: 300D Features: Fontaine Flight Jacket is made of very ﬁne rip-stop check pattern waterproof and breathable fabric. Soft touch removable Sherpa ﬂeece liner offers extra warmth in the cold work environment and winter season. Twin stitched 5cm retroreﬂective tapes around the body and each arm, with two top shoulder reﬂective tapes for best eye level visibility and design. Right chest pocket with waterproof zip closure and concealed well-made ID card holder, which can be placed out at use. A radio/walkie-talkie loop on the top right chest. Left chest is ideal for decoration. Two way bottom pockets lined with ﬂeece for extra warmth. Heavy duty two way zips under the Velcro closure storm ﬂap. Pen and mobile phone pockets on the left arm. Pile lined collar with concealed removable hood. Friendly elasticated bottom made for the wearer’s comfort and ﬂexibility. Inside bottom zip access for decoration. Compliant to EN ISO20471 Class 3 & EN342:2004 providing protection against cold, and Orange conforms to GO/RT 3279 for railway industry. HVP209 Fontaine Flight Jacket Sizes: S-3XL Carton Qty: 10 Fabric: Fontaine Rip-Stop Check Pattern Polyester Weight: 300D Features: Fontaine Flight Jacket is made of very ﬁne rip-stop check pattern waterproof and breathable fabric. Soft touch removable Sherpa ﬂeece liner offers extra warmth in the cold work environment and winter season. Twin stitched 5cm retroreﬂective tapes around the body and each arm, with two top shoulder reﬂective tapes for best eye level visibility and design. Right chest pocket with waterproof zip closure and concealed well-made ID card holder, which can be placed out at use. A radio/walkie-talkie loop on the top right chest. Left chest is ideal for decoration. Two way bottom pockets lined with ﬂeece for extra warmth. Heavy duty two way zips under the Velcro closure storm ﬂap. Pen and mobile phone pockets on the left arm. Pile lined collar with concealed removable hood. Friendly elasticated bottom made for the wearer’s comfort and ﬂexibility. Inside bottom zip access for decoration. Compliant to EN ISO20471 Class 3 & EN342:2004 providing protection against cold, and Orange conforms to GO/RT 3279 for railway industry. HVP189 Ladies Executive Jacket Sizes: XS-2XL Carton Qty: 10 Fabric: 100% Polyester Weight: 300D Features: A superb tailor-ﬁt ladies’ Hi-Vis Windproof, Waterproof & unpadded breathable Jacket. Comforms to EN ISO20471 Class 3 and EN 343:2003 + A1:2007 Class 3.3. Fully taped seams to ensure waterproof and self colour mesh lining for best breathable quality. Part elasticated waist for style. Angled pockets under the reﬂective piping storm ﬂaps closed with Velcro. Storm cuffs with Velcro adjustment & soft touch internal cuffs for comfort. Heavy duty two way front zip to chin with Velcro fastening storm ﬂap. Concealed hood in collar with Velcro closure. Internal right breast smart phone pocket . Internal bottom concealed zip access for decoration. Well thought features with function for all the ladies at work. HVW180 Ladies Executive Waistcoat Sizes: XS-2XL Carton Qty: 100 Fabric: 100% Polyester Weight: 120gsm Features: A well-designed ladies’ Hi Vis Waistcoat combined with style and function. Breathable open mesh back and part elasticated waist for comfort. Stylish reﬂective piping on both sides with concealed pocket access. Additional two inside pockets. Matching colour front zip closure. Compliant to EN ISO 20471:2013 Class 2 and ANSI/ISEA 107-2015 Standards. HVW820 Executive Open Mesh Waistcoat Sizes: S - 3XL Carton Qty: 100 Fabric: 100% Polyester Weight: 110gsm Features: Conforms to American National Standard ANSI/ISEA 107-2004 & European EN ISO20471:2013 Class 1 & 2. Made of breathable light weight mesh knitted fabric in order for the wearers to easily sweat out in the warm environment. 5cm Wide reﬂective tape around the body and over each shoulder. Full front zip closure. Very useful multiple pockets and radio loop provide superb convenience. Mobile phone/walkie-talkie pocket to front left chest. Two bottom pockets with ﬂaps and accessible from both the top and the side; Pen pockets & key holder. ID pocket on right hand chest. A lightweight mesh executive waistcoat to make you feel cool. It is purpose designed to satisfy the customers, who works at a warm environment and requests plenty of pockets for convenience. Ideal for US & European markets. HVW120 Top Cool Open Mesh 2 Band & Braces Waistcoat Sizes: M - 3XL Carton Qty: 100 Fabric: 100% Polyester Weight: 110gsm Features: ANSI/ISEA 107-2004 American National Standard EN ISO20471:2013 Class 2 - European. Hook and loop fastening; Two 5cm width reﬂective tapes around the body. Made of breathable light weight mesh knitted fabric in order for the wearers to keep workers comfortable in hot working environments; 5cm wide reﬂective tape around the body and over each shoulder; Hook and loop fastening in the front. HVW100ASFR Sleeveless Anti-Static & LFS Waiscoat Sizes: S-3XL Carton Qty: 100 Fabric: EN 14116 & EN 1149 Knitted Polyester Weight: 120gsm Features: Compliant to ISO 20471 Class 2 and EN 14116 Index 1 against heat & ﬂames and EN 1149 for anti-static protection. Two 5cm width reﬂective tapes around the body and one over each shoulder. Hook and loop front fastener. H910  o - -i HVJ910 Top Cool V-Neck T-Shirt Sizes: S-3XL Carton Qty: 70 Fabric: 100% Polyester Weight: 130gsm Features: Top cool V-neck mesh high visibility T-shirt. Made of newly designed super light mesh fabric and perforated mesh reﬂective tapes to achieve the maximum breathable quality and keep the wearers cool and comfortable. Regular ﬁt - true to size. Soft rib-knitted collar & cuffs in selfmatching colour; Individually bagged; Decoration friendly and quick dry. Hi Vis Yellow & Orange & combined conform to EN ISO20471:2013 Class 2, Orange & Orange/Navy also conforms to GO/RT 3279; Black & Navy provide enhanced visibility. HVK07 Zip Hoodie Sizes: S - 3XL Carton Qty: 20 Fabric: 100% Polyester Weight: 280gsm Features: Hi Vis Yellow and Orange conforms to EN ISO 20471 Class 3 & Orange is also GO/RT 3279 railway industry certiﬁed. Made of 280 gsm Anti-pill single jersey knitted softfeel polyester fabric. Two 5cm width reﬂective tapes around the body and arms and over each shoulder. Drop hood with draw cord adjustment. Full length front zip. Two Handwarmer pockets. Twin needle stitching throughout. HV016T Jogging Pants Sizes: S-3XL Carton Qty: 20 Fabric: 100% Polyester Weight: 280gsm Features: Hi Vis Yellow and Orange conforms to EN ISO 20471 Class 1 & Orange is also GO/RT 3279 Railway use certiﬁed. Black & Navy provide enhanced visibility. Made of 280 gsm Anti-pill single jersey knitted soft-feel polyester fabric. Fully elasticated waist with well-made drawcord. Two 5cm width retro reﬂective tapes bands higher up to the mid thigh. Cargo pocket with velcro ﬂap on both legs. Two Hip pockets with zip closure. One rear patch pocket with velcro ﬂap. Elasticated ankles. Comfortable to wear allowing maximum movement without restriction. A key trend smart work and casual jogging pants with wide colour choices to be worn with everyday looks at work and after work. Combining a tailored edge with leisurewear, YOKO creates jogging bottoms with a sports inspired outfit. Super soft and comfortable to wear allowing maximum movement without restriction. HVDW15 Reﬂective Border Dog’s Vest Sizes: S - L Carton Qty: 100 Fabric: 100% Polyester Weight: 300D Features: Ideal to keep your dog safe and visible all the time. Strong tear and release velcro fastening under the neck and body. Both reﬂective band and border offer extra visibility. Large decoration area to have the dog’s name, club logo etc on;. HVK09 Hi-Vis Softshell Jacket Sizes: S - 4XL Pack: 5 Carton: 15 Fabric: Outer: 345gsm 3 layer waterproof 8,000mm bonded 100% Polyester fabric Mid-layer: TPU waterproof Inner-layer: MicroﬂeeceWeight: 345gsm Weight: 345gsm Features: Hi-Vis Yellow & Hi-Vis Yellow/Navy, Orange and Orange/ Navy conform to EN ISO20471:2013 Class 3; Orange and Orange/Navy conform to GO/RT 3279 & approved for the railway industry; Navy provides enhanced visibility; 3 layers softshell fabric ensures 8000mm breathable & 3000 mvp waterproof; Outer layer: 100% polyester; Middle layer: TPU membrane; Inner layer: 140D warm & comfort microﬂeece; 5cm width reﬂective tapes around the body and arms, one over each shoulder; 100% waterproof zippers & branded zipper pullers applied to the front and chest pocket; 2 hand warmer pockets with zipper fastening; Rubber cuff adjusters & draw cord hem adjuster; Shaped lower back for style; Navy contrast helps to provide a corporate image and hide scuff marks. J HV006 Softshell Gilet Sizes: S - 3XL Carton Qty: 20 Fabric: 3 layer waterproof 8,000mm bonded 100% Polyester fabric Mid-layer: TPU waterproof Inner-layer: Microﬂeece Weight: Outer-layer, 345gsm Features: EN ISO20471:2013 Class 2 - Hi-Vis Yellow & Hi-Vis Yellow/Navy, Orange and Orange/Navy. Black & Navy provide enhanced visibility. 5cm width reﬂective tapes around the body and one over each shoulder; 100% waterproof zippers & branded zipper pullers applied to the front and chest pocket; 2 hand warmer pockets with zipper fastening; shaped lower back for style; navy contrast helps to provide a corporate image and hide scuff marks. J HVW701 Chevron Bomber Jacket Sizes: S - 3XL Carton Qty: 10 Fabric: 300D PU Coated Polyester outer fabric; Weight: 260gsm Features: ISO20471:2013 Class 3 & EN343 Class 3:1 - Against foul weather. YOKO Chevron Collection is deisgned to be immune from metal detector & scanner and ideal for electronic, telecommunication industries etc. Smart diagonal chevron reﬂective tapes around the body & arms for style and safety; soft touch quilted navy microfabric lining; concealed lined hood with draw cord; mobile phone pocket on the right hand chest with reﬂective-piping ﬂap sealed with velcro; pen holder (for 2-3 pens) on the left arm; elasticated cuffs with adjustable Velcro; navy ﬂeece collar; heavy duty zipper up to the chin with chin protector; velcro-sealed storm ﬂap with puller for convenience; zip pocket under the front storm ﬂap to the right hand side; two bottom pockets with reﬂective-piped ﬂaps; inner velcrosealed pocket on the right hand side. J HVW702 Chevron Motorway Jacket Sizes: S - 3XL Carton Qty: 10 Fabric: 300D PU Coated Polyester outer Weight: 260gsm Features: EN ISO20471:2013 Class 3 & EN343 Class 3:1 - Against foul weather. YOKO Chevron Collection is designed to be immune from metal detector & scanner and ideal for electronic, telecommunication industries etc. Smart diagonal chevron reﬂective tapes around the body & arms for style and safety; soft touch quilted navy microfabric lining; concealed lined hood with draw cord; mobile phone pocket on the right hand chest with reﬂectivepiping ﬂap sealed with velcro; pen holder (for 2-3 pens) on the left arm; open cuffs with adjustable Velcro; navy ﬂeece collar; heavy duty zipper up to the chin with chin protector; Velcro-sealed storm ﬂap with puller for convenience; Zip pocket under the front storm ﬂap to the right hand side; two bottom pockets with reﬂective-piped ﬂaps; Inner velcrosealed pocket on the right hand side. HVW703 Chevron Quilted Gilet/Jacket Sizes: S - 3XL Carton Qty: 10 Fabric: 300D PU Coated Polyester Weight: 260gsm Features: EN ISO20471:2013 Class 2. YOKO Chevron Collection is designed to be immune from metal detector & scanner and ideal for electronic, telecommunication industries. Mobile phone pocket, reversible, interactive zip. 300d PU Coated Polyester outer fabric; smart diagonal chevron reﬂective tapes around the body for style and safety; soft touch quilted navy micro fabric lining on the body and arms; the sleeves are detachable; mobile phone pocket on the right hand chest with reﬂective-piping ﬂap sealed with Velcro; Elasticated cuffs; Interactive zipper; Two bottom pockets with reﬂective-piped ﬂaps; Inner Velcro-sealed pocket on the right hand side; two-way zip & Interactive with HVW704. J HVW704 Chevron Mesh Lined Motorway Jacket Sizes: S - 3XL Carton Qty: 10 Fabric: 300D PU Coated Polyester outer Weight: 110gsm Features: EN ISO20471:2013 Class 3 & EN343 Class 3:1 - Against foul weather. YOKO Chevron Collection is designed to be immune from metal detector & scanner and ideal for electronic, telecommunication industries etc. Smart diagonal chevron reﬂective tapes around the body & arms for style and safety; soft touch quilted navy microfabric lining; concealed lined hood with draw cord; mobile phone pocket on the right hand chest with reﬂective-piped ﬂap sealed with velcro; pen holder (for 2-3 pens) on the left arm; open cuffs with adjustable Velcro; navy ﬂeece collar; heavy duty zipper up to the chin with chin protector; Velcro-sealed storm ﬂap with puller for convenience; zip pocket under the storm ﬂap to the right hand side; two bottom pockets with reﬂective-piping ﬂaps; inner velcro-sealed pocket on the right hand side; two-way zip & Interactive with HVW703. J HV008SL Quilted Jacket With Detachable Sleeves Sizes: S - 3XL Carton Qty: 15 Fabric: 300D PU Coated Polyester Weight: 180gsm Features: EN ISO20471 Class 2. Two 5cm reﬂective tapes around body and one brace over each shoulder; waterproof 300D PU coated polyester fabric; 180gsm diamond quilted polyester padding; zip detachable sleeves suitable for multiple uses; full length zip fastening up to the chin; two bottom patch pockets. J HV008F Reversible ﬂeece Body Warmer Sizes: S - 3XL Carton Qty: 20 Fabric: 100% Polyester Weight: 280gsm Features: EN ISO20471:2013 Class 2. Lightweight Hi-Vis & reversible ﬂeece body warmer to stay visible & keep warm; waterproof PU coated Polyester fabric with reverse anti-pill Navy ﬂeece; full length zip fastening up to chin; 2 hand-warmer pockets on both sides; embroidery access. J HVK08 Heavyweight Fleece Jacket Sizes: S - 3XL Carton Qty: 15 Fabric: 100% Polyester Weight: 380gsm Features: EN ISO20471:2013 Class 3 GO/RT 3279 - Also Orange and Orange/ Navy approved for the railway industry. Two 3M reﬂective tapes around body and arms, one brace over each shoulder; full length matching colour zip in the front; comfort-ﬁt elasticated cuffs, fully elasticated hem, two lower welted pockets and a high-neck comfort collar; ideal thermal workwear for airport personnel, couriers, offshore mining, road maintenance staff and refuse collectors, etc. J HVK10B Two-Tone Fleece Jacket Sizes: S - 3XL Carton Qty: 15 Fabric: 100% Polyester Weight: 380gsm Features: EN ISO20471:2013 Class 3 Two. 5cm reﬂective tapes around body and arms; full length zip in the front; comfort-ﬁt elasticated cuffs, fully elasticated hem, two lower welted pockets and a high-neck comfort collar; navy contrast helps to provide a corporate image whilst disguising scuffs around hem and cuffs area; large Decotation area. J HV015J Polycotton Work Jacket Sizes: S - 3XL Carton Qty: 10 Fabric: 80% Polyester 20% Cotton Weight: 280gsm Features: EN ISO20471 Class 3 GO/RT 3279 - Orange. Made of 245gsm 80/20 polycotton fabric (polyester outside & cotton inside) treated with durable water repellent ﬁnish; 3M reﬂective tape around the body and arms; 2 chest pockets buttoned with ﬂaps; both cuffs fastened with buttons. J HVP211 Classic Bomber Jacket Sizes: S - 6XL Carton Qty: 10 Fabric: 300D Outer Weight: 190gsm Features: EN ISO EN20471:2013 Class 3 & EN343 - Hi-Vis Yellow, Orange & Orange/Yellow, against foul weather GO/RT 3279 - Orange. Heavy duty zip with studded storm ﬂap; 2 outer pockets with over ﬂaps; Matching colour self-fabric elastication at cuffs and hem; Diamond quilted Nylon lining with 190g Polyester padding; Inside patch pocket; Throughout stitched and taped seams to ensure waterproof; Foldaway hood; Matching trousers available, reference HVS461, HVS462 & HVS463. Black and Navy provide enhanced visibility (non-EN471 standard). J HVP218 Two Tone Bomber Jacket Sizes: S - 3XL Carton Qty: 10 Fabric: 300D Outer Weight: 190gsm Features: EN ISO471:2013 Class 3 & EN343 - against foul weather GO/ RT - Orange/Navy. Waterproof Oxford PU coated Polyester outer fabric; navy contrast helps to provide a corporate image whilst disguising dirt around the hem and cuff areas; quilted Nylon lining with 190g Polyester wadding; heavy duty zip front with studded storm ﬂap; navy elastication at cuffs and hem; 2 outer pockets with storm ﬂaps; inside patch pocket; concealed Velcro in hood with draw cord adjuster; fully stitched and taped seams to ensure 100% waterproof. J HVP219 4-in-1 Fleece Bomber Jacket Sizes: S - 3XL Carton Qty: 10 Fabric: 100% Polyester Weight: 280gsm Features: EN ISO20471:2013 Class 3 & EN343 Class 3.1 - against foul weather. The outer jacket is made of 300D PU Coated polyester outer fabric with 190T liner; heavy duty zip front with studded storm ﬂap; two outer pockets with storm ﬂaps; inside breast pocket; concealed hood with adjustable drawcord; fully stitched and taped seams for waterproof; 280gsm Interactive detachable inner ﬂeece jacket with removable sleeves to be converted to a ﬂeece gilet; adjustable draw cord hem; two zipped lower pockets. J HVP300 Classic Motorway Jacket Sizes: S - 6XL Carton Qty: 10 Fabric: 100% Polyester, 300D Outer Weight: 190gsm Features: EN ISO471:2013 Class 3 & EN343 - against foul weather GO/RT 3279 - Orange. Waterproof PU coated Polyester with 190g quilted padding and Nylon lining; Heavy-duty zip with studded storm ﬂap; 2 outer pockets with storm ﬂaps; knitted storm-cuffs in the sleeve ends; concealed hood with draw cord adjuster; inside breast pocket; fully stitched and taped seams to ensure waterproof; Matching trousers available, reference HVS461, HVS462 & HVS463. J HVP301 Security Jacket Sizes: S - 3XL Carton Qty: 10 Fabric: 420D Nylon Oute Weight: 190gsm Features: Fully waterproof & windproof security jacket with the enhanced visibility for safety; PU coated Nylon outer fabric with 190g quilted padding and Nylon lining; heavy duty zip with studded storm ﬂap; 2 outer pockets with over ﬂaps; elasticated Knitted storm cuffs in the sleeve ends; step collar with a concealed integral hood; inside breast pocket; throughout stitched and taped seams to ensure waterproof; matching trousers available, code HVS461. J HVP302 Two-Tone Motorway Jacket Sizes: S - 3XL Carton Qty: 10 Fabric: 100% Polyester Weight: 190gsm Features: EN ISO20471:2013 Class 3 & EN343 Class 3.1 - against foul weather GO/RT 3279 - Hi-Vis Orange/ Navy. Waterproof PU coated 300D Polyester with 190gsm quilted padding & Nylon lining; two 5cm 3M reﬂective tapes around the body and arms, and one over each shoulder; navy contrast helps to provide a corporate image and hide scuff marks; heavy duty zip under the studded storm ﬂap; two outer pockets with storm ﬂaps; knitted storm-cuffs in the sleeve ends; concealed hood with draw cord; inside breast pocket; stitched and taped seams to ensure waterproof; matching trousers, codes HVS461 & HVS462 & HVS463. 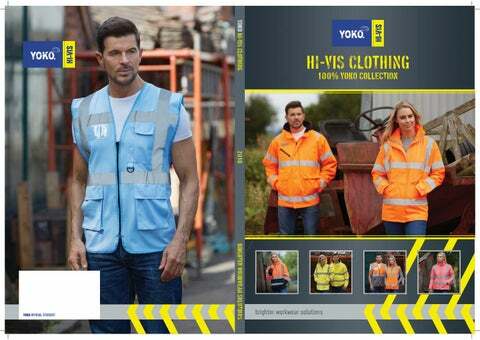 HVP303 Contrast Jacket Sizes: S - 3XL Carton Qty: 10 Fabric: 100% Polyester, 300D Weight: 190gsm Features: EN ISO20471:2013 Class 3 & EN343 Class 3.1 – Hi Vis Yellow/ Orange; EN ISO20471:2013 Class 1 & EN343 Class 3.1 – Hi Vis Yellow/Royal Blue, Red & Paramedic Green. A great choice of vibrant contrast colours waterproof & windproof jackets with the enhanced visibility for safety; Ideal for football ground staff, event organizers, car park wardens, Fire Marshalls and paramedic personnel etc. ; Oxford PU coated polyester outer fabric with 190g diamond quilted padding; Walkie Talkie/Mobile phone pocket; Two front pockets & one inside security pocket. J HVP305 Tartan Contractor Jacket Sizes: S - 3XL Carton Qty: 10 Fabric: 100% Polyester Weight: 260gsm Features: EN ISO20471:2013 Class 3 & EN343 Class 3.1 - against foul weather. Waterproof Oxford PU coated 300D Polyester with Polycotton check lining to improve warmth & comfort; two 5cm 3M reﬂective tapes around the body and each arm, and one over each shoulder; heavy duty YKK two-way zipper with studded storm ﬂap; Two angled side pockets with storm ﬂaps; knitted storm-cuffs in sleeve ends; Concealed Velcro in hood with draw cord; inside breast pocket; titched and taped seams to ensure waterproof. J HVP311 3-in-1 Traffic Jacket Sizes: S - 3XL Carton Qty: 10 Fabric: 100% Polyester Weight: 190gsm Features: EN ISO20471:2013 Class 3 & EN343 Class 3.1 – Outer Jacket EN ISO20471:2013 Class 2 – Inner Gilet/Bodywarmer. Waterproof PU coated 300D Polyester Outer Fabric with nylon liner & fully taped seams, also concealed Velcro-in hood with draw cord; Inner Gilet - Conforms to EN ISO20471 Class 2; Reversible can be worn with Hi-Vis yellow or navy side outermost; waterproof PU coated 300D Oxford polyester outer fabric; two 5cm reﬂective tapes around body and one brace over each shoulder; 190gsm diamond quilted polyester padding; two bottom pockets on each side. J HVP212AM Amber Traffic Management Bomber Jacket Sizes: S - 3XL Carton Qty: 10 Fabric: 100% Polyester Weight: 260gsm Features: EN ISO20471:2013 Class 3 & EN343 Class 3.1 - against foul weather. 5cm width Reﬂexite® GP340 red amber shoulder reﬂective tapes; 5cm width 3M reﬂective tapes around the body and arms; 300D waterproof Oxford PU Coated polyester outer fabric; Fleece collar on inner side for comfort, heavy duty zip covered with storm ﬂap; ID pocket, mobile phone pocket and key holder on the right hand side; two hand warmer pockets with over ﬂaps; adjustable cuffs; stitched and tapes seams to ensure 100% waterproof; ideal for traffic management, highway agencies etc. J HVP301AM Amber Traffic Management Motorway Jacket Sizes: S - 3XL Carton Qty: 10 Fabric: 100% Polyester Weight: 190gsm Features: EN ISO20471:2013 Class 3 & EN343 Class 3.1 - against foul weather. 5cm width red amber tapes over each shoulder; 3M reﬂective tape around the body and arms; the contrary colours of the tapes offer better visibility; heavy duty zip under the studded storm ﬂap; 300D PU coated polyester outer fabric with light weight polyester lining; 2 bottom patch pockets; inside document pockets with zip closure; elasticated adjustable cuffs; stitched and taped seams; ideal for traffic management, highway agencies etc. J HVP711 High Visibility Multi-Functional 7-in-1 Jackets Sizes: S-5XL (4XL & 5XL available in Hi Vis Yellow & Orange Only) Pack: 5 Carton: 10 Fabric: 300D PU Coated Polyester Weight: 260gsm Features: Outer Jacket: Conforms to EN ISO20471:2013 Class 3; Orange and Orange combined conform to GO/RT 3279 & approved for the railway industry; Breathable & waterproof PU coated 300D Oxford Polyester outer fabric lined with mesh liner Fully stitched and taped seams for 100% waterproof. Two external hand warmer pockets. Concealed detachable hood. Mobile phone & ID pockets on the chest. Interactive inner zipper to detach inner jacket Inner Jacket: Conforms to EN ISO20471:2013 Class 2; Orange and Orange combined conform to GO/RT 3279 & approved for the railway industry; Detachable sleeves to form a hi-vis bodywarmer or reversible to a black bodywarmer for Hi Vis Yellow & Orange jackets, and navy or grey bodywarmer for 2-Tone jackets. Two pockets on both sides of inner jackets. J HVJ610 Sports & Leisure Jacket Sizes: S - 3XL Carton Qty: 10 Fabric: 100% Polyester Weight: 110gsm Features: A great lightweight waterproof & breathable Hi Vis Fluoresocent jacket ideal for sports and leisure wearing. Hi Vis Fluoresocent body with black shoulders and drop tail; 5mm reﬂective laces around wrists, arms and back for visibility; mesh lining and open back for better breathability, as well as with the under-arm mesh fastened with zip; ﬂeece stand-up collar with draw cord; adjustable elasticated cuffs with Velcro; two hand pockets with zipper access; full zip with full Velcro closure ﬂap for safety; drop tail can be folded away with four buttons; two way draw cords on the hem; concealed zip pocket at the back for keys etc. J HVS450 Soft Flex Breathable Rain Jacket Sizes: S-3XL Carton Qty: 10 Fabric: 100% Polyester Weight: 300D Features: EN ISO 20471 Class 3 & EN343 Class 3.2 GO/RT 3279 - Orange. Made of soft touch breathable PU transfer coated outer fabric with mesh liner; 3M heat sealed reﬂective tapes around the body and arms; one brace over each shoulder; drop hood; elasticated cuffs; two lower pockets; draw cord on the hem; stitched and tape welded seams throughout. J HVS451 Soft Flex Breathable Rain Trousers Sizes: S-3XL Carton Qty: 10 Fabric: 100% Polyester Weight: 300D Features: EN ISO 20471 Class 3 & EN343 Class 3.2 GO/RT 3279 - Orange. Made of soft touch breathable PU transfer coated outer fabric; 3M heat sealed reﬂective tapes around the bottom of each leg; two access pockets; snap buttons for adjustable ankle; stitched and tape welded seams throughout. J WC336 Nylon Rain Jacket & Trousers Sizes: Jacket/Trousers: S-3XL Carton Qty: 20 Fabric: 100% Nylon Weight: 180gsm Features: Hardwearing waterproof rain jacket and trousers; made of waterproof PVC coated Nylon fabric; stitched and tape welded seams. Jacket features two pockets, concealed hood and a draw cord hem. Trousers feature elasticated waist, two access pockets and press stud fastening at ankle. HVS457 Soft Flex Breathable Rain Jacket & Trousers Sizes: Jacket/Trousers: S-3XL Carton Qty: 10 Fabric: 100% Polyester Weight: 300D Features: Made of soft touch PU transfer coated breathable and waterproof outer fabric; stitched and tape welded seams throughout. Jacket features two pockets, concealed hood, concealed zip under front storm ﬂap, and a draw cord hem. Trousers feature elasticated waist, two access pockets and press stud fastening at ankle. HVS470 Promo Rain Poncho Sizes: Child, Regular & Large; Carton Qty: Child/160, Regular/130 & Large/130 Fabric: 100% polyester Weight: 190gsm; Features: Lightweight shower-proof PU coated Polyester. Inside stitched and taped seams, Large hood, Neck zip. Supplied with a self-fabric pouch, Ideal for all kinds of music events, festivals, cycling, camping, sea-side activities etc. Large decoration area for screen printing & heat transfer. Wt HVW100 2 Band & Braces Waistcoat Sizes: S - 5XL (4XL & 5XL available in Hi Vis Yellow, Orange, Red, Black & RoyalBlue) Fabric: 100% Polyester Weight: 120gsm Features: 100% Polyester fabric with Velcro® fastening. Two 5cm width reﬂective tapes around the body and one over each shoulder. Hi-Vis Yellow, Orange, Yellow/Orange conform to EN ISO20471:2013 Class 2; Black, Lime, Navy, Purple, Paramedic Green, Red, Raspberry, Royal Blue Yoke on Hi Vis Yellow conform to EN ISO20471:2013 Class 1; All other colours provide enhanced visibility in all kinds of environments. Yellow, Orange & Yellow/ Orange - EN ISO20471 C2. All other 2-Tone colours conform to Class 1. The rest colours provide enhanced visibility. Wt HVW106 Top Cool Mesh Vent Waistcoat Sizes: M - 2XL Carton Qty: 100 Fabric: 100% Polyester Weight: 120gsm Features: EN ISO20471:2013 Class 2 - H-Vis Yellow & Orange GO/RT 3279 Orange. A comfortable Hi-Vis waistcoat with a back vent and mesh lining Zip fastening - great if you have to wear a tie! Mobile phone pocket – suitable for most sizes of phones; two bottom patch pockets; ID pocket with clear window. Wt HVJ800 Executive Sleeved Waistcoat Sizes: S - 3XL Carton Qty: 50 Fabric: 100% Polyester Weight: 120gsm Features: EN ISO20471:2013 Class 3. 5cm wide reﬂective tapes around the body and arms; one over each shoulder; mobile phone/walkie-talkie pocket to front left chest; full length front zipper fastening; two bottom pockets with ﬂaps and accessible from both the top and the side; pen pockets & key holder; ID pocket on right hand chest; Large area on reverse for decoration. Wt HVW109 Stud Front Waistcoat Sizes: S - 3XL Carton Qty: 100 Fabric: 100% Polyester Weight: 120gsm Features: EN ISO20471:2013 Class 2. Snap studs fastening; Two 5cm width reﬂective tapes around the body and one over each shoulder. Wt HVW102 2 Bands Waistcoat Sizes: M - 3XL Carton Qty: 100 Fabric: 100% Polyester Weight: 120gsm Features: EN ISO20471:2013 Class 2 - Yellow & Orange. Velcro® fastening; two 5cm width reﬂective tapes around the body. Wt HVJ200 Long Sleeve Waistcoat Sizes: S - 3XL Carton Qty: 70 Fabric: 100% Polyester Weight: 120gsm Features: EN ISO20471:2013 Class 3. Two 5cm reﬂective tape band and braces conﬁguration with two bands encircling the full length sleeves; touch and close front Velcro fastening. Wt HVJ202 Premier Two Tone Recovery Jerkin Sizes: M - 3XL Carton Qty: 70 Fabric: 100% Polyester Weight: 120gsm Features: EN ISO20471:2013 Class 3. Hi-Vis Yellow/ Orange 2-tone colours contrast offers better visibility; two white 5cm prismatic reﬂective tape around the body and arms, and one over each shoulder; touch and close front Velcro fastening; Walkie Talkie/ Mobile phone pocket on right hand side; ideal for highway agency, rescue team, traffic management etc. Wt HVJ201 3/4 Sleeved Waistcoat Sizes: S - 3XL Carton Qty: 70 Fabric: 100% Polyester Weight: 120gsm Features: EN ISO20471:2013 Class 3. Two 5cm reﬂective tape band and braces conﬁguration with two bands encircling the 3/4 length sleeves; touch and close front Velcro fastening. .
Wt HVW118PC Premier Railway Pull-Apart Polycotton Waistcoat Sizes: S - 3XL Carton Qty: 60 Fabric: 80% Polyester, 20% Cotton Weight: 280gsm Features: GO/RT 3279, EN ISO20471:2013 Class 2 & EN510 For anti-entanglement. One 5cm width 3M reﬂective tape around the body and over each shoulder, “V” shape reﬂective tapes in the front and ‘ll’ shape at rear; 80/20 Polycotton fabric treated with durable water repellent ﬁnish; brass studs fastening on shoulders and sides for quick release in case of emergency; zip fastening in the front; partly elasticated action back. HVW118PE Pull-Apart Polyester Waistcoat Sizes: S - 3XL Carton Qty: 50 Fabric: 100% Polyester Weight: 120gsm Features: GO/RT 3279, EN ISO20471:2013 Class 2 & EN510 - For anti-entanglement. One 5cm width reﬂective tape around the body and over each shoulder, “II” shape reﬂective tapes in the front and ‘ll’ shape at rear; light weight Polyester Fabric; Velcro® fastening on shoulders and sides for quick release in case of emergency; Velcro® fastening in the front; partly elasticated action back. HVW118YE Pull-Apart Polyester Waistcoat Sizes: S - 3XL Carton Qty: 100 Fabric: 100% Polyester Weight: 120gsm Features: EN ISO20471:2013 Class 2 & EN510 - For anti-entanglement. Two 5cm width reﬂective tape around the body and one over each shoulder, light weight polyester fabric; Velcro® fastening in the front; Velcro® fastening on shoulders and sides for quick release in case of emergency; plain straight back. Wt HVJ220AM Amber Traffic Management Sleeved Mesh Waistcoat Sizes: S - 3XL Carton Qty: 70 Fabric: 100% Polyester Weight: 120gsm Features: EN ISO20471:2013 Class 3. 5cm width Reﬂexite® GP340 red amber shoulder reﬂective tapes; 5cm width 3M reﬂective tapes around the body and arms; much improved breathable garment with ventilated mesh shoulder, both sides and under arms; seamed ID Pocket & mobile Phone Pocket on the right hand side; ideal for traffic management, highway agencies etc. Wt HVW105AM Amber Traffic Management Sleeveless Waistcoat Sizes: S - 3XL Carton Qty: 100 Fabric: 100% Polyester Weight: 120gsm Features: EN ISO20471:2013 Class 2. 5cm width red amber shoulder reﬂective tapes and two 5cm width silver reﬂective tapes around the body; 100% polyester fabric with Velcro fastening; ideal for traffic management, highway agencies etc. Wt HVJ200AM Amber Traffic Management Sleeved Waistcoat Sizes: S- 3XL Carton Qty: 70 Fabric: 100% Polyester Weight: 120gsm Features: EN ISO20471:2013 Class 3. 5cm width red amber shoulder reﬂective tapes and two 5cm width silver reﬂective tapes around the body and arms; 100% polyester fabric with Velcro fastening; Ideal for traffic management, highway agencies etc. Wt HVW100FR Flame Retardant Sleeveless Waistcoat Sizes: S - 3XL Carton Qty: 100 Fabric: 100% Polyester Carton Qty: 100Weight: 120gsm Features: EN533 - Index 1 Protection against Heat & Flames EN ISO20471:2013 Class 2. 100% Polyester fabric with Velcro® fastening; two 5cm width reﬂective tapes around the body and one over each shoulder. HVJ200FR Flame Retardant Sleeved Waistcoat Sizes: S - 4XL Carton Qty: 70 Fabric: 100% Polyester Weight: 120gsm Features: EN533 - Index 1 Protection against Heat & Flames EN ISO20471:2013 Class 3. 100% Polyester fabric with Velcro® fastening; two 5cm width reﬂective tapes around the body and arms; one brace over each shoulder. HVJ259 Reﬂective Border Tabard Sizes: Child, S/M & L/XL Carton Qty: 120 Fabric: 100% Polyester Weight: 120gsm Features: Great sporting event, outdoor activities & promotional tabards with reﬂective border around for the extravisibility, 10cm elastication and 10cm Velcro fastening on each side for wide chest adjustment and comfortable wearing. Large decoration area on the front & rear. Wt HVJ269 2 Bands Tabard Sizes: S - XL Fabric: 100% Polyester Weight: 120gsm Features: EN11550:1999 - Hi-Vis Yellow & Orange. 10cm elastication and 10cm Velcro fastening on each side for wide chest adjustment and comfortable wearing; two 5cm reﬂective bands around the body; ideal for cyclists, football teams, charity workers etc. P  HVJ210 Short Sleeve Polo Sizes: S - 6XL Carton Qty: 50 Fabric: 100% Polyester Weight: 210gsm Features: EN ISO20471:2013 Class 2 GO/RT 3279 - Orange. Two 5cm width 3M reﬂective tapes around the body and one over each shoulder; contrast knitted navy collar and cuff; 3 button placket; twin needle stitching; individually bagged. P  HVJ310 Long Sleeve Polo Sizes: S - 6XL Carton Qty: 40 Fabric: 100% Polyester Weight: 210gsm Features: EN ISO20471:2013 Class 3 GO/RT 3279 - Orange. Two 5cm width reﬂective tapes around the body and arms, and one over each shoulder; contrast knitted navy ribbed collar & cuffs; 3 button placket; twin needle stitching; individually packed; ideal for the working environment with high speed moving vehicle/machines and also where the arms require to be covered. HVJ910 Top Cool V-Neck T-Shirt Sizes: S-3XL Carton Qty: 70 Fabric: 100% Polyester Weight: 130gsm Features: Top cool V-neck mesh high visibility T-shirt. Made of newly designed super light mesh fabric and perforated mesh reďŹ&#x201A;ective tapes to achieve the maximum breathable quality and keep the wearers cool and comfortable. Regular ďŹ t - true to size. Soft rib-knitted collar & cuffs in selfmatching colour. Individually bagged. Decoration friendly and quick dry. Hi Vis Yellow & Orange & combined conform to EN ISO20471:2013 Class 2, Orange & Orange/Navy also conforms to GO/RT 3279; Black & Navy provide enhanced visibility. Th HVJ410 Short Sleeve T-Shirt Sizes: S - 6XL Carton Qty: 70 Fabric: 100% Polyester Weight: 200gsm Features: EN ISO20471:2013 Class 2 GO/RT 3279 - Orange. Two 5cm width reﬂective tapes around the body and one over each shoulder; Made of soft-feel Polyester fabric for comfortable wearing; Soft rib-knitted collar & cuffs in self-matching colour; Individually bagged. Sr   HVK06 1/4 Zip Sweatshirt Sizes: S - 3XL Carton Qty: 20 Fabric: 100% Polyester Weight: 280gsm Features: EN ISO20471:2013 Class 3 GO/RT 3279 - Orange. Two 5cm width reﬂective tapes around body & arms, one over each shoulder; Anti-pill ﬂeece fabric with warm jersey lining; self fabric lined stand-up collar; ¼ zipper with self-matching colour trim; ribbed cuffs and waistband; twin needle stitching throughout. Sr   HVJ510 Sweatshirt Sizes: S - 3XL Carton Qty: 20 Fabric: 100% Polyester Weight: 280gsm Features: EN ISO20471:2013 Class 3 GO/RT 3279 - Orange. Two 5cm width reﬂective tapes around body & arms, one over each shoulder; Anti-Pill ﬂeece fabric; taped back neck for extra comfort; drop shoulder & crew neck style; ribbed neck, cuffs and hem; twin needle stitching throughout. T HVW705 Chevron Trousers Sizes: S - 3XL Carton Qty: 10 Fabric: 300D PU Coated Polyester outer Weight: 110gsm Features: EN ISO20471:2013 Class 3. YOKO Chevron Collection is designed to be immune from metal detector & scanner and ideal for electronic, telecommunication industries etc. smart diagonal chevron reﬂective tapes around each leg for style and safety; additional reﬂective tapes along the front of each leg for extra visibility; two access pockets with reﬂective-piping ﬂaps; adjustable bottoms with zippers on the inside of each leg; rear pocket with reﬂective-piping ﬂap. T HV018T Polycotton Cargo Trousers With Knee Pad Pockets Sizes: 28” - 48” (Reg), 30” - 48” (Long) - Waist 28” only available in Regular Leg Fabric: 80% Polyester, 20% Cotton Carton Qty: 30 Weight: 340gsm Features: EN ISO20471:2013 Class 1 - Hi-Vis Yellow & Orange GO/RT 3279 - Orange. 80/20 Polycotton fabric treated with durable water repellent ﬁnish; two 5cm width 3M reﬂective tapes on the bottom of each legs; partly elasticated waistband with 5 belt loops; match-colour zip ﬂy & button; two cargo pockets with extra reﬂective tape & border trimming to enhance the visibility; knee pads pocket with concealed access; rear pocket with button fastening. T HV015T Polycotton Work Trousers Sizes: 28 - 48, Regular Legs & 30”-48” for Long Legs Carton Qty: 40 Fabric: 80% Polyester 20% Cotton Weight: 280gsm Features: EN ISO20471 Class 3 GO/ RT 3279 - Orange. Made of 80/20 Polycotton fabric (polyester outside & cotton inside) treated with durable water repellent ﬁnish; two 5cm width 3M reﬂective tapes around the bottom of each leg; triple stitched seams on legs for improved durability; front zip ﬂy with concealed hook and bar fastening; single pleat waistband with ﬁve belt loops; elasticated at both sides of waist for freedom & comfort; 2 side swing pockets & 1 rear jetted hip pocket with button fastening. T YK015T Reﬂective Polycotton Work Trousers Sizes: 28 - 48, Regular Legs & 30”-48” for Long Legs Carton Qty: 40 Fabric: 65% Polyester 35% Cotton Weight: 245gsm Features: Made of 65/35 Polycotton twill fabric; elastication at both sides of waist for freedom & comfort; waistband with 5 belt loops and button fastening; 2 side swing pockets; two 5cm width reﬂective tapes on each leg to enhance the visibility; zip ﬂy in the front; rear patch pocket with button fastening. T BS015T Reﬂective Polycotton Ballistic Trousers Sizes: 28 - 48, Regular Legs & 30”-48” for Long Legs Carton Qty: 40 Fabric: 65% Polyester 35% Cotton Weight: 245gsm Features: EN388: 2003. Made of 245gsm 65/35 Polycotton fabric with EN388: 2003 tested Nylon ballistic material on outside of legs, from ankle to thigh; Reliable protection & functionality; Front zip ﬂy with concealed hook and bar fastening; Waistband with ﬁve belt loops; elastication at both sides of waist for freedom & comfort; 2 side swing pockets & 1 rear jetted hip pocket; two 5cm width reﬂective bands on the bottom of each leg to enhance the visibility; ballistic nylon panels on the outer legs offer maximum protection against glass, tin cans and other dangerous materials; suitability. Ideal for local authorities and councils, refuse workers, security guards etc. T HVS461 Waterproof Over Trousers Sizes: S - 4XL Carton Qty: 60 Fabric: 100% Polyester with Oxford PU coating, 100% waterproof Weight: 300D Features: EN ISO20471:2013 Class 1 - Hi-Vis yellow Class 1 EN343 Against foul weather. Black and Navy provide enhanced visibility (non-EN471 standard). Two 5cm wide reﬂective bands around lower legs; elasticated waistband; snap buttons on the bottom for adjustment; more colours available, code HVS462 & HVS463; Matching jackets, code HVP211, HVP218, HVP300, HVP301 & HVP303. T HVS462 Waterproof Over Trousers Sizes: S - 3XL Carton Qty: 60 Fabric: 100% Polyester Weight: 300D Features: EN ISO20471:2013 Class 1, EN343 - Against foul weather GO/RT 3279 - Approved for railway industry. 100% waterproof Polyester with Oxford PU coating; two 5cm wide reﬂective bands around lower legs; elasticated waistband; stitched and taped seams; snap buttons on the bottom for adjustment; more colours available, code HVS461 & HVS463; matching jackets, code HVP211, HVP300 & HVP303. T HVS463 Two-Tone Waterproof Over Trousers Sizes: S - 3XL Carton Qty: 60 Fabric: 100% Polyester Weight: 300D Features: EN ISO20471:2013 Class 1, EN343- Against foul weather GO/RT 3279 - Orange/Navy also approved for railway industry. Navy contrast helps to provide a corporate image whilst disguising dirt around the hem area. 100% waterproof Polyester with Oxford PU coating; two 5cm wide reﬂective bands around lower legs; elasticated waistband; stitched and taped seams; snap buttons on the bottom for adjustment. More colours available. Code HVS461 & HVS462. Matching jackets code HVP211 & HVP300. T HV015TFR Reﬂective Flame Retardant Trousers Sizes: XS - 3XL, 28”-50” for Regular Legs & 30”-48” for Long Legs Carton Qty: 40 Fabric: 100% Cotton Weight: 300gsm Features: ISO11612 A1 B1 C1 SO11611 Class2 A1. Made of 300gsm cotton drill fabric with ﬂame retardant treatment; two 5cm width reﬂective tapes on the bottom of each leg; brass zip ﬂy; button waistband fastening; seven belt loops; two vertical side seam access pockets. Cs HV058 Polycotton Coverall Sizes: S - 6XL, Inner Leg Length - 31” for S-3XL and 32” for 4XL-6XL Carton Qty: 20 Fabric: 80% Polyester 20% Cotton Weight: 280gsm Features: EN ISO20471 Class 3 GO/ RT 3279 - Orange. Made of 80/20 Polycotton fabric (polyester outside & cotton inside) treated with durable water repellent ﬁnish; Two 5cm width 3M reﬂective tapes around body, arms and the bottom of each leg; triple stitched seams along inner legs for improved durability; two-way matching colour zipper; 2 chest pocketed buttoned with over ﬂaps; 2 side swing pockets & 1 rear patch pocket; elasticated action back. Cs HV058FR Reﬂective Flame Retardant Coverall Sizes: S - 4XL, 28”-48” for Regular Legs & 30”-48” for Long Legs Carton Qty: 20 Fabric: 100% Cotton Weight: 300gsm Features: ISO11612 A1 B1 C1 ISO11611 CLASS 2 A1. Made of 300gsm cotton drill fabric with ﬂame retardant treatment; one 5cm width reﬂective tapes on the bottom of each leg & arm and shoulder; concealed stud front to neck; one left breast pocket with ﬂap; two front access pockets. HVS269CH Kids 2 Bands Tabard Sizes: S - L Carton Qty: 100 Fabric: 100% Polyester Weight: 120gsm Features: EN1150:1999. Side elastication and press button. Two 50 mm width reﬂective tape around the body. Large front & rear area for decoration. Cs HVW100CH Kids 2 B&B Waistcoat Sizes: 3XS - L Carton Qty: 100 Fabric: 100% Polyester Weight: 120gsm Features: EN1150:1999. 100% polyester fabric with velcro fastening. 50mm width reﬂective tape around the body and each shoulder. Size 3XL, 2XL & XS come without shoulder reﬂective tapes to ensure good printing area. HVW102CH Children 2 Bands Waistcoat Sizes: S-L Carton Qty: 100 Fabric: 100% Polyester Weight: 120gsm Features: EN1150: 1999 - Yellow & Orange only. Polyester fabric with velcro fastening; 2.5cm width reﬂective tape around the body. Cs HVP302CH Childrens Two-Tone Jacket Sizes: S - L Carton Qty: 10 Fabric: 100% Polyester Weight: 190gsm Features: EN1150: 1999. A great choice of vibrant contrast colours waterproof & windproof jackets with the enhanced visibility for children’s safety. Oxford PU coated 300D polyester outer fabric with 190g diamond quilted padding; two 5cm width reﬂective tapes around the body and arms; one over each shoulder; two front pockets & one inside patch pocket. Cs HV008FCH Childrens Reversible Fleece Bodywarmer Sizes: S - L Carton Qty: 20 Fabric: 100% Polyester Weight: 180gsm Features: EN1150: 1999. Waterproof PU coated polyester outer fabric; two 5cm width reﬂective tapes around the body and one over each shoulder; zip fastening; 180 grams navy ﬂeece fabric on the reverse; two inner and outer pockets. Light weight and comfortable wearing. Cs HVP211CH Childrens Bomber Jacket Sizes: S - L Carton Qty: 20 Fabric: 100% Polyester Weight: 190gsm Features: EN1150: 1999. Waterproof 300D Oxford PU coated polyester outer fabric; two 5cm width reﬂective tapes around the body and arms; one over each shoulder; front zip with studded storm ﬂap; 2 slanted outer handwarmer pockets; elasticated knitted cuffs and hem in black colour; 190gsm diamond quilted padding; concealed hood; stitched and taped seams. Cs HVP300CH Childrens Motorway Jacket Sizes: S - L Carton Qty: 20 Fabric: 100% Polyester Weight: 190gsm Features: EN1150: 1999. Waterproof 300D Oxford PU coated Polyester outer fabric; two 5cm width reﬂective tapes around the body and arms; one over each shoulder; front zip with studded storm ﬂap; 190gsm quilted padding; 2 outer lower pockets with storm ﬂaps; knitted storm-cuffs in the sleeve ends; concealed hood; stitched and taped seams. S  c HVW070 Car Seat Belt Cover Sizes: 32cm Length & 15cm Width Carton Qty: 100 Fabric: PU Coated Polyester Weight: 300D Features: Ideal for promoting Road Safety awareness. Made of high visibility and ﬂuorescent background material with two 5cm wide reﬂective bands for night time visibility. Strong hook and loop fastening. TFC100 Safety Bump Cap Sizes: One Size Carton Qty: 50 Fabric: Pu Coated Nylon for Hi Vis Yellow & Orange, 100% Cotton for other colours Weight: 165gsm Features: EN812. Built for safety and comfort. Protective polycarbonate inner shell; mesh eyes improve airﬂow; high density foam pads; removable cover ideal for embroidery etc. S  c HVW069 Draw String Bag Sizes: One Size: 44H x 34W cm - 13 Litres Suggested Decoration area: 15 x 26cm Carton Qty: 200 Fabric: 100% Polyester Weight: 210D Features: Hi-Vis ﬂuorescent drawstring water-resistant backpack for both work and leisure uses. Reinforced corners with metal eyelets & reﬂective material; strong Nylon cord carry handles; suitable for screen printing, transfer printing & embroidery on both sides. Features: Enhanced visibility reﬂective book bag. Made of waterproof 600D polyester; inner Name card holder; rip-strip closure; padded handle. YK903 NATO Security Sweater Sizes: S - 4XL Carton Qty: 20 Fabric: 100% Acrylic Weight: 540gsm Features: Superb quality rib-knitted V-Neck NATO security sweater; 100% Acrylic body; 100% Cotton epaulettes holder, shoulder and elbow patches; 7 gauge; full cut & general ﬁt; Machine washable. S  c CT01 Clip-On Ties Sizes: One Size. Blade width: 3.34”/8.5cm, Blade length: 18”/46cm” Carton Qty: 300 Fabric: 100% Polyester Weight: 120gsm Features: Clip-on ties for quick release in emergency; Made of 100% polyester; hand stitched; ideal for securities, doormen, prison officers and law-enforcement; suitable for embroidery and press print; hand wash recommended. EP01 Epaulettes Sizes: One Size: L8 x W5 cm Carton Qty: 300 Fabric: 100% Polyester Weight: 120gsm Features: Tapered woven epaulette; velcro fastening; ideal for embroidery and printing; sold in pairs. Features: Hi-Vis Yellow and Orange provide good visibility in the darkness; 100% soft-touch Acrylic hat with beige colour 3M Thinsulate® lining for warmth; double layer thickness; smooth knitting ﬁnish ideal for embroidery. Features: EN ISO20471:2013. Visibility in the darkness and reﬂective at night; 5cm width; one simple heat-seal operation to apply (160-190° for 10-20 seconds); hardwearing and weatherproof; washable at 60°; 25 wash cycles; not recommended for Nylons and fabrics treated with a durable water repellent (DWR) ﬁnish. Easy application to T-shirts, Polos, etc; Reﬂective Elements. Features: EN ISO20471:2013. Brilliance pattern design; 5cm width; Visibility in the day light; machine sew on; hardwearing and weatherproof; washable at 60°; 25 wash cycles; ideally to be made for arm bands, sashes, belts etc. ; Reﬂective Elements. Features: EN ISO20471:2013. Visibility in the darkness and reﬂective at night; 5cm width; machine sew on; hardwearing and weatherproof; washable at 60°; 25 wash cycles; Reﬂective Elements. Features: ISO EN20471: 2013 - High visibility yellow and orange. A great colour choice of reﬂective arm bands; 50mm reﬂective tape in the middle for the visibility in the darkness and at night; made of durable 300D waterproof bright colours fabric; ﬁtted with strong 10cm long adjustable Velcro fastening. Features: ISO EN20471: 2013 - High visibility yellow and orange Easily decorate-able arm bands with great colour choices; Made of durable 300D waterproof bright colours fabric; Fitted with strong 10cm long adjustable Velcro fastening. Features: ISO EN20471: 2013 - High visibility yellow and orange. Easily decorate-able arm bands with great colour choices. Made of durable 300D waterproof bright colours fabric; Fitted with strong 10cm long adjustable Velcro fastening. Features: Professional, durable and waterproof ID arm bands. ID pocket can hold cards up to 110 x 65mm; adjustable self-matching colour elasticated straps for comfortable and secure wearing; ID cards can easily slide in for clear and noticeable display. PVC ID pouch is suitable for digital printing; ideal for emergency services, security staff, local authorities, utility services personnel, charity workers, event organisers & door supervisors etc; wipe clean only. Sizes: One Size: 200(W) x 150(H) x 20(D)mm Carton Qty: 75 Fabric: 100% Polyethylene Weight: 300D Features: EN14404:2004 Made from pressure absorbing foam; lightweight and comfortable; suitable for all knee pad type trousers; retail display package. Features: Made of EN ISO20471:2013 compliant 300D durable and waterproof PU coated polyester.Co-ordinated colour zip closure; Hanging loop for display and storage; Both sides are printable; Ideal packs for brochures, hi vis vests, working gloves, torch, ﬂags, note pads, pens, promotional gifts etc. Features: Conforms to EN388 2142 intermediate design; 13 gauge white knitted Nylon/Cotton gloves with red PVC dots on palm & ﬁngers; Nylon outer for protection and Cotton inner for comfort; Ideal for general handling, sorting application and light duty applications. Features: EN13356:2001. Made of 5cm width EN13356 compliant Reﬂexite® reﬂective material with buckle adjustors. Keep safe on the roads; reﬂective Elements. Features: EN 388:4122. Conforms to EN 388:1994 Cat II Intermediate Design; Robust & tactile Nitrile coating on seamless nylon liner to provide good comfort and dexterity; Knitted wrist. Good grip in wet, dry and oily conditions. Features: EN 388:2121. Superior Conforms to EN 388:1994 Cat II Intermediate Design. Ideal gloves when secure grip in wet and dry conditions is required; crinkle latex coating for great grip; seamless Hi Vis liner for wearer comfort & safety; knitted wrist to ensure close ﬁt; also available with thermal ﬂeece liner under code SW035TH. Features: EN 388:2143. Superior quality leather driver’s glove. Conforms to EN 388:1994 Cat II Intermediate Design; soft and comfortable, yet tough and durable; Keystone thumb for enhanced comfort and dexterity; joss stick elasticated back for a safe secure ﬁt; full cotton ﬂeece lining for warmth and comfort; supple leather reduces hand and ﬁnger fatigue. Features: A very useful ﬂuorescent bright waterproof holdall for both work and leisure use. One main compartment; front pocket with easy access for decoration; internal base board with external studs; reinforced webbed carrying handles with polyester/Velcro wrap; reinforced webbed adjustable shoulder strap; reinforced padded handle at each end; 5cm width reﬂective tapes on all four sides for visibility & safety. Sizes: One Size: 20 - 25 Litres Carton Qty: 150 Fabric: 100% Polyester Weight: 190gsm Features: Suitable for most (20 - 25) litre rucksacks for better visibility & safety. Two 25mm vertical reﬂective tapes to enhance visibility in the darkness; front mesh pocket; elasticated edging with simple ﬁxing fasteners. All colours are 100% waterproof with taped inside seams. Suitable for screen printing & transfer printing etc. Features: This ﬂuorescent bright waterproof rucksack is designed for both work and leisure use. Made of 600D waterproof polyester; one main compartment with inside separation; internal pocket for MP3/iPod with rubber outlet for earphones; 2 side mesh pockets; front expandable pocket to ﬁt a standard ball/helmet; webbed carrying handle; adjustable padded shoulder straps; 25mm reﬂective strips on three sides.